Inquiring minds have been asking me how far the housing bubble busting has progressed. Many are asking "Is this the bottom?" It's a good question, so let's take a look at several viewpoints: Bernanke's, mine, and a friend of mine who prefers to be known simply as "BC". CNBC is reporting Bernanke Expects Housing Recovery by Year End. Federal Reserve Chairman Ben Bernanke told lawmakers Tuesday he expects the downtrodden U.S. housing sector to improve by the end of the year, a senator who participated in the closed-door meeting said. "He let us believe that the housing situation should begin to ameliorate by the end of the year," said Sen. Pete Domenici, a New Mexico Republican, told reporters. Using the Japanese land bust model as my guide, here is how I have called things in real time. The Spring 2008 arrow was just added. The arrow is one notch closer to its final destination. The initial data point was established in the post It's a Totally New Paradigm on March 26, 2005. Here are some excerpts from that post. Gregory J. Heym, the chief economist at Brown Harris Stevens, is not sold on the inevitability of a downturn. He bases his confidence in the market on things like continuing low mortgage rates, high Wall Street bonuses and the tax benefits of home ownership. "It is a new paradigm" he said. Inquiring minds may wish to review Bernanke: There's No Housing Bubble to Go Bust. My friend "BC" just sent me his estimate as to where we are, also in graphical form. 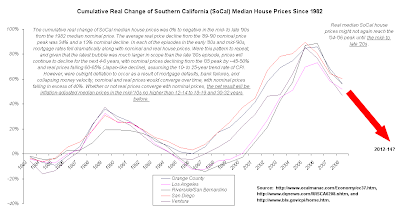 The SoCal housing bust remains on track (and for the US overall). Nominal prices will likely not bottom out until the early to mid-'10s. Were the historical pattern to repeat, real house prices will not again reach the '04-'06 peak until the mid- to late '20s or perhaps even later. US nominal household net wealth is set to decline steadily over the next 4-6 yrs. (and possibly well beyond), a phenomenon not experienced since the Great Depression in the US and in Japan since the early to mid-'90s. The Federal Reserve cannot print US household net wealth into existence. See When Will Housing Bottom? for additional charts from "BC". 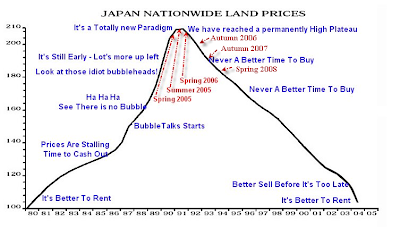 The striking thing to me is how similar the Japan Nationwide Land Prices Chart is to the Southern California chart above that I have been using as my model. The new paradigm is now called walking away. There is even a national referendum on walking away. See Moral Obligations Of Walking Away for details. This paradigm is still in the early innings. Auction signs are now sprouting up all over California. The Sacramento region is being hit especially hard as foreclosures nearly equal home sales in January. In the most ominous indicator yet of the Sacramento region's struggling housing market, January saw nearly as many people lose their homes as buy them. The nearly equal number of home sales and foreclosures stems from still-rising numbers of bank repossessions and what's typically one of the slowest months on the real estate sales calendar. Still, the tallies reveal an unprecedented phenomenon in a region where sales and home values have been declining since summer 2005. Every business day during January in the region, an average of 85 people lost their homes to lenders, almost double the number of foreclosures from September, according to Foreclosures.com, a Web site for real estate investors. The foreclosures -- more than 10,000 last year in the eight-county capital region -- are fast pushing down home sales prices. Sacramento County's 1,077 closed escrows for new and existing homes were the lowest for January since 1996. The 354 home sales in Placer County were the lowest since 1995 for a January. Common wisdom says there is no such thing as a national housing bubble. The reason often cited is "All Real Estate Is Local". Please consider a chart of total sales by region from the National Association of Realtors (NAR). Inquiring minds will also want to take a look at state by state data. And with a hat tip to Calculated Risk for the previous link, one can see that year over year sales declined in 46 states plus D.C, with no data available for Indiana, New Hampshire, and Idaho. Sales increased in South Dakota. Clearly the real estate bust is well contained to 49 states + D.C. It's a good thing for those South Dakota numbers too, otherwise we might be talking about the busting of the national housing bubble.